Dr. Ronda’s Examples: Out of having an unusual background of atheist parents, not married, came a great witness of the miracles of my conversion; out of not fitting in at school very well came, as a teacher, the desire to make my class work easy to understand; out of not being a perfect wife and mother came clinging to Jesus in daily Mass and in prayer; out of not fitting in with certain Catholic groups came many graces from other movements in the Church; out of crosses on some jobs came lots of graces and benefits to students at other places. Out of the suicide of my son came trust in God’s mercy and more empathy for the sufferings of all people. Out of being a widow came becoming a dedicated widow of the Church. Dear Jesus, many time in the past I felt crushed by crosses. I find that You brought good out of each of these real sufferings. Some of these goods I only realized decades later. 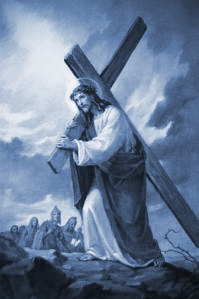 Help me to accept my present crosses with real trust that Your plans are for the good even if the crosses are heavy. Let me walk hand in hand with you one step at a time into the future.